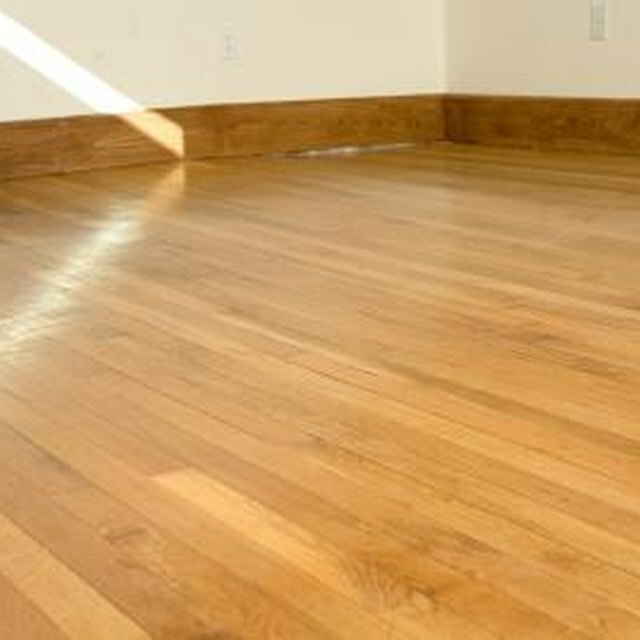 Keeping a hardwood floor looking its best is a challenge. Scratches from furniture and worn spots from traffic make the floor look dull and dingy. However, a simple buffing followed by a new coat of floor finish will bring back the floor's luster and shine without the hassle and mess of a full sanding and staining. Remove all furniture and obstacles from the room. Sweep and vacuum the floor to remove all dirt, grime and loose debris. Place a grit screen on the floor. Minor scratches and wear will require a disc rated at 80 or 100 grit. The lower the number, the more aggressive the screen. On top of the screen, place a one-inch thick white or red buffing pad. Finally, maneuver the buffing machine with the block brush attached onto the buffing pad. The weight of the machine will hold the pad and screen in place. Buff the floor with the grain of the wood from left to right. Overlap for complete coverage. Sweep and vacuum the floor to remove dust. Then, clean the floor with a rag dipped in mineral spirits. Allow the floor to dry. Repeat with a fine grit screen, rated at 120 or 150 grit. Apply the floor finish, according to the manufacturer's instructions. If the floor has only minor scratches, it may be possible to skip right to the fine grit (120 or 150 grit) discs. Use mineral spirits only in well-ventilated areas, away from open flames. What Is a Floor Burnisher Used For?